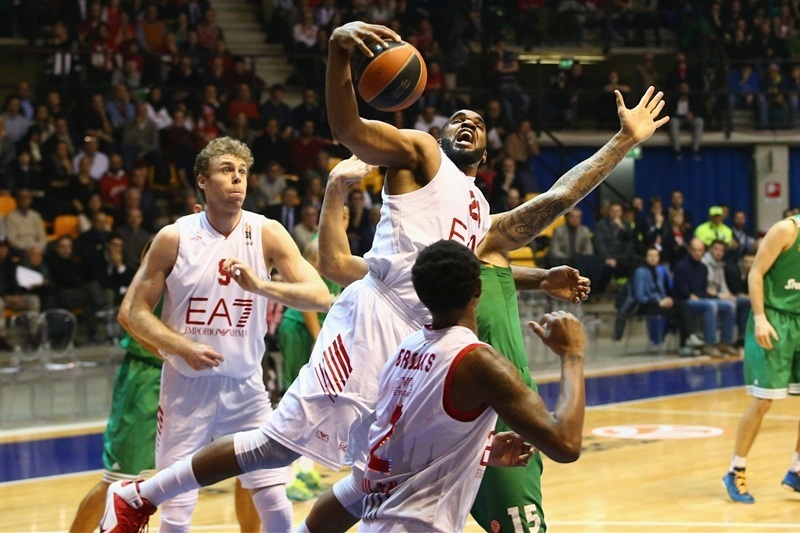 EA7 Emporio Armani Milan survived a tough fight to beat Panathinaikos Athens 66-64 at home and advance to the Top 16 of the Turkish Airlines Euroleague. Milan, which improved to 4-5 in Group C, needed either a win or a loss by PGE Zgorzelec Turow at Bayern Munich to move on. 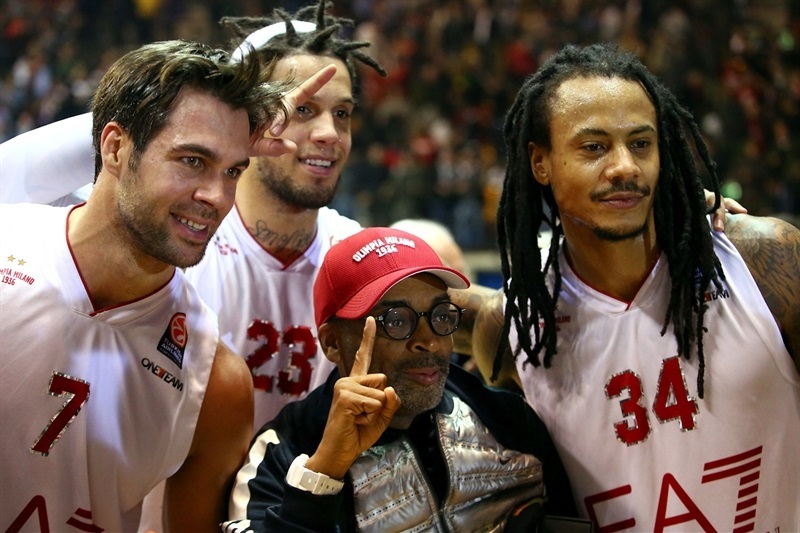 The Italian champion actually secured a spot during the third quarter when Munich won. 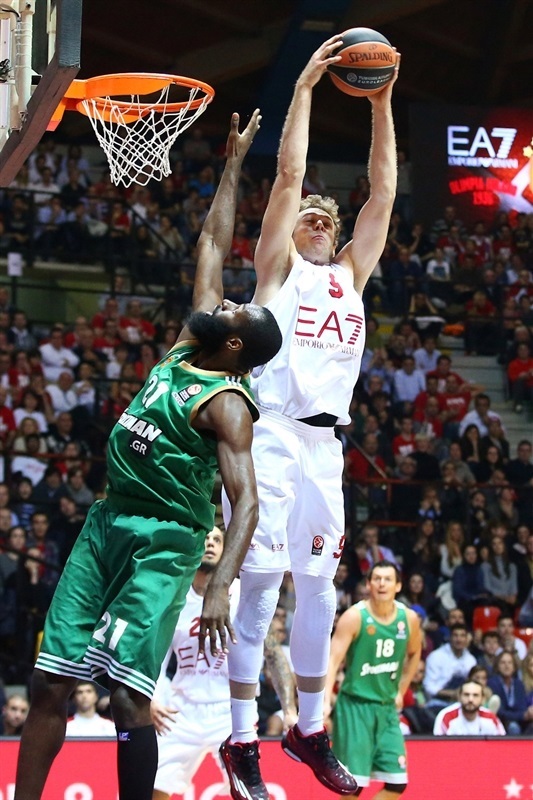 But Milan finished strong and took care of business, thanks in part to Panathinaikos veteran Dimtris Diamantidis missing two free throws with 0.7 seconds left which would have tied the game. Daniel Hackett led the way with 21 points for Milan, while Alessandro Gentile had 9 points, 3 rebounds, 3 assists and 3 steals. 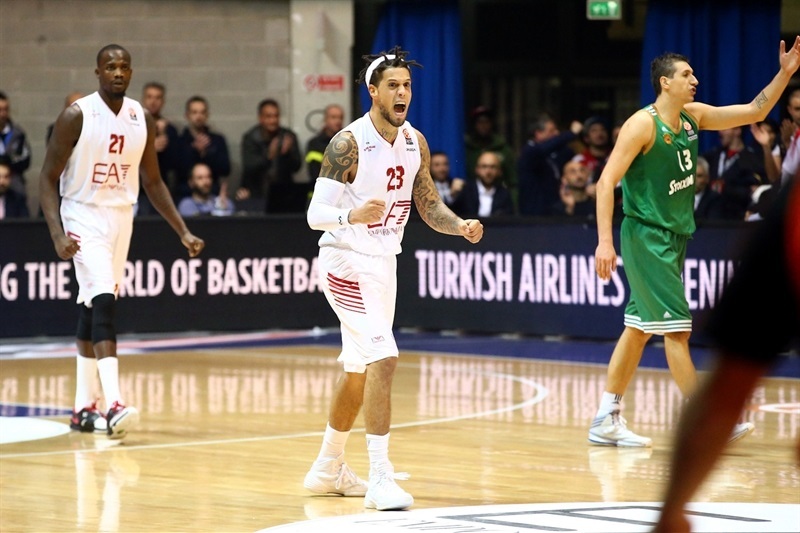 Janis Blums scored 13 points and Diamantidis had 12 points and 11 assists for the Greens, who dropped to 5-4 – having already qualified for the Top 16 before the game. Panathinaikos turned the ball over 21 times, losing despite out-rebounding Milan 41-28 and holding Milan to 7-of-30 (23.3%) from three-point range. 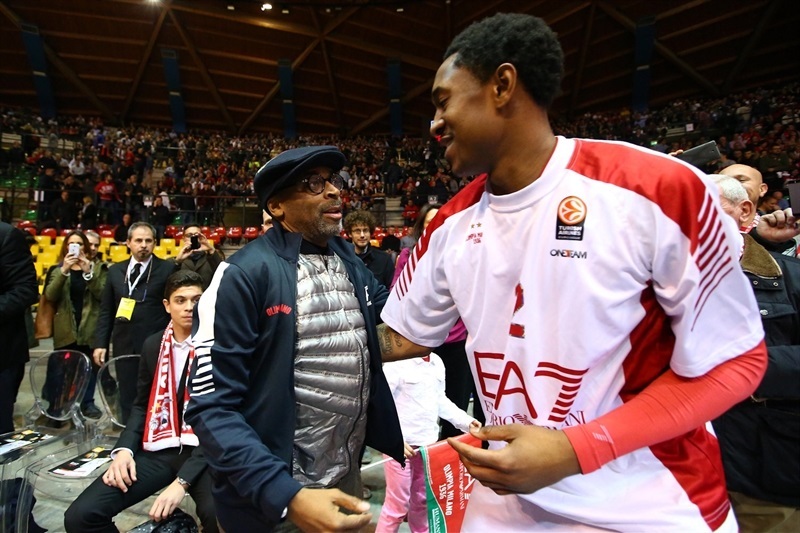 Milan coach Luca Bianchi swapped one player in his starting line-up with MarShon Brooks in the first five for Joe Ragland with Hackett, Gentile, Nicolo Melli and Samardo Samuels. Panathinaikos coach Dusko Ivanovic made one change to his line-up with Antonis Fotsis coming for Julian Wright alongside Diamantidis, A.J. Slaughter, Vlantimir Giankovits and James Gist. Hackett got the hosts on the board first with a tough basket off the glass. Slaughter answered with a jumper and then a put-back off his own miss. Brooks evened the game and then made two free throws and a layup after a steal to give Milan an 8-4 lead going into the first TV timeout. Esteban Batista scored off the glass after some fine footwork for the guests before a Hackett triple from the right side made it 11-6. 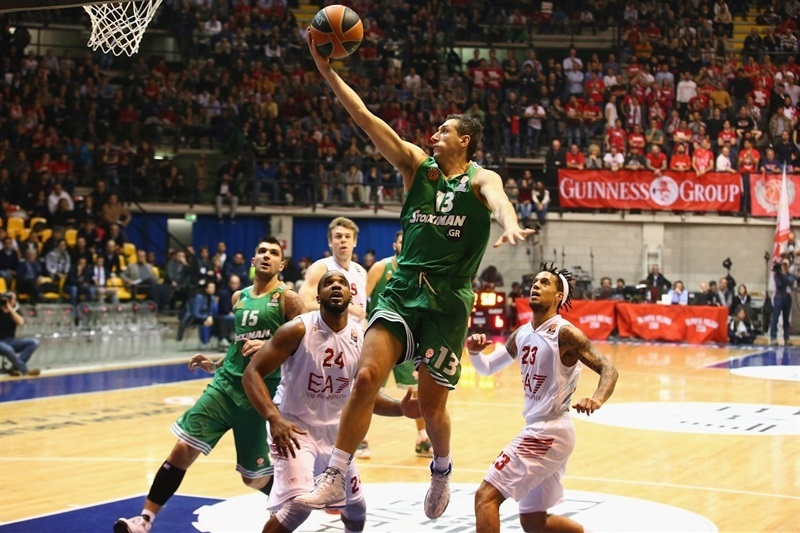 Diamantidis raced back down to the other end for a driving layup before Gentile grabbed a rebound and went coast to coast for a layup and a 13-8 Milan lead. There was then a stoppage in play late in the first quarter to fix a hole in the Paladesio parquet under the Panathinaikos basket. Gentile scored the first basket after the maintenance work to push the cushion to 7, which Slaughter trimmed with a three-pointer from the left side. But Melli’s three from the left wing left Milan up 18-11 after one quarter. Blums came off the bench for the guests and got Panathinaikos right back into the game with back-to-back threes from the right wing to cut the deficit to 18-17, resulting in a Milan timeout. Ragland finally got the hosts on the scoreboard two minutes into the quarter with a driving layup. Shawn James came on for a hook shot and then a dunk off a pass from Hackett to up the Milan lead to 26-19, which resulted in a Panathinaikos timeout. Slaughter made a pair of free throws, but Hackett grabbed a steal and breakaway layup and then a great Bruno Cerella steal going out of bounds turned into a Linas Kleiza dunk and a 30-21 advantage with just more than three minutes left in the half. Ragland got hit with a technical foul and Blums made the free throw and James Gist threw down a dunk on the ensuing possession. The Panathinaikos push continued as Loukas Mavrokefalides hit a layup and Diamantidis converted 2 free throws to bring the Greens all the way to within 30-28. But Hackett beat the final buzzer with a floater for a 32-28 lead at the break. Panathinaikos continued its strong play to start the second half with a long Diamantidis jumper and a Fotsis three-pointer to take a 32-33 lead. Milan went two minutes without a score until 3 Gentile free throws pushed the hosts back ahead 35-33. Slaughter converted at the other end and a Diamantidis three made it 36-38. Panathinaikos committed three straight turnovers while Samuels had a layup and then a three-pointer and was followed by a triple from David Moss for a 44-38 lead. Fotsis came back down and nailed a three-pointer to halve the deficit. 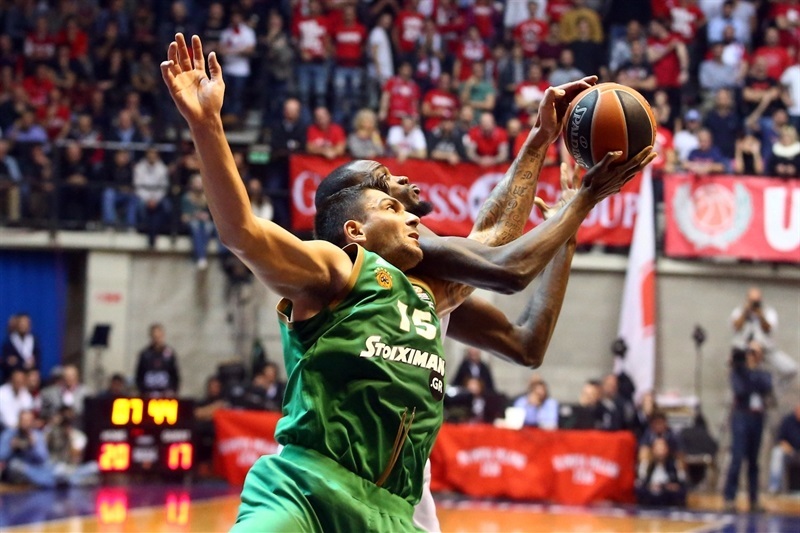 Gist then made 2 foul shots and Panathinaikos led 45-46 after a Diamantidis triple – and a Milan time out. The lead switched hands on the next five possessions – on threes by Hackett and Slaughter and then a Samuels dunk and a put back off an offensive rebound by Gist before Gentile’s jumper made it 52-51 after three quarters. Hackett converted an improbable basket and-one for a 55-51 lead to start the quarter. 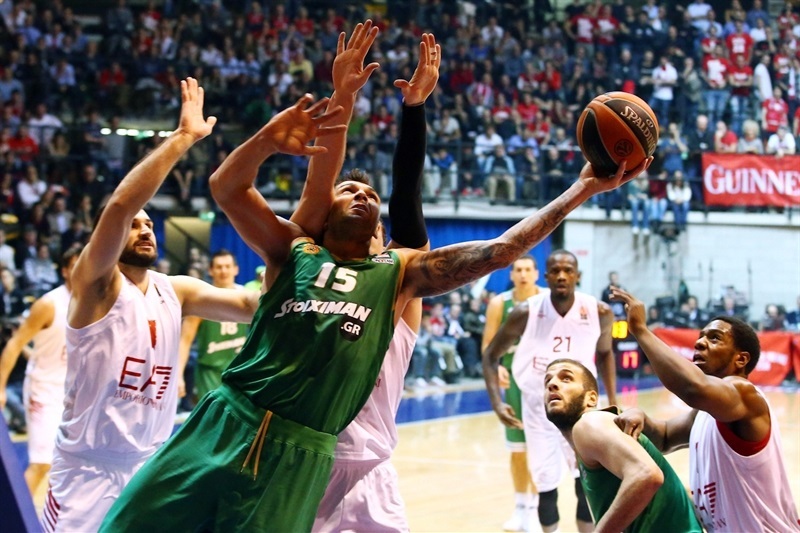 But Gist was fed nicely by Diamantidis for a dunk and Slaughter’s three put Panathinaikos back ahead, 55-56. Ragland answered with a three-pointer, which caused a time out for the Greens. Ragland came out of the talk with a layup and Cerella followed with a layup of his own as Milan went up 62-56 with three minutes left. Blums was able to nail a tough three-pointer, but Hackett punched right back with a three to make it 65-59. Blums knocked down a corner three and then Wright made 2 free throws to cut the margin to 65-64 with less than two minutes left. 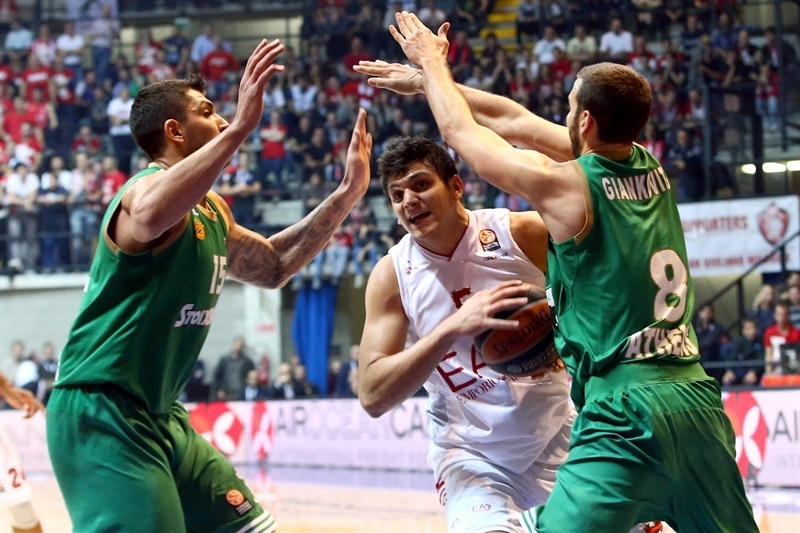 Both teams struggled to convert until Melli split free throws with 25 seconds left for a 66-64 Milan margin. 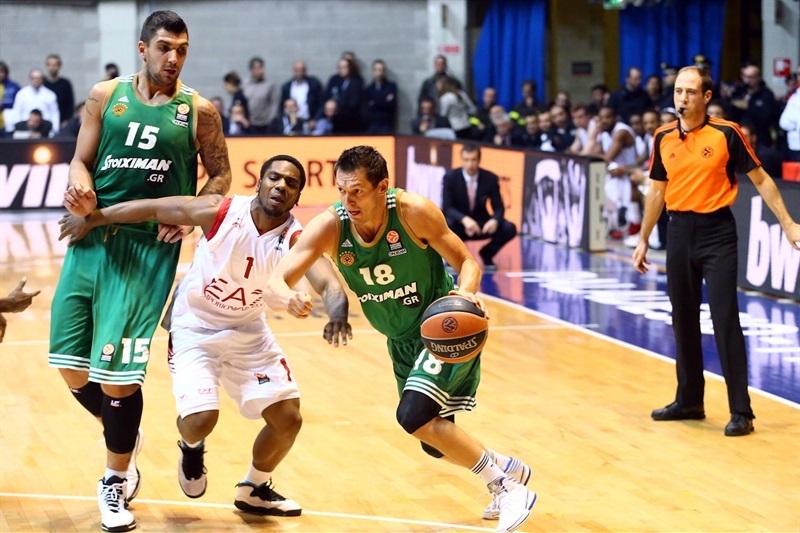 Diamantidis initially lost the ball with 1.3 seconds left, but Panathinaikos retained possession. 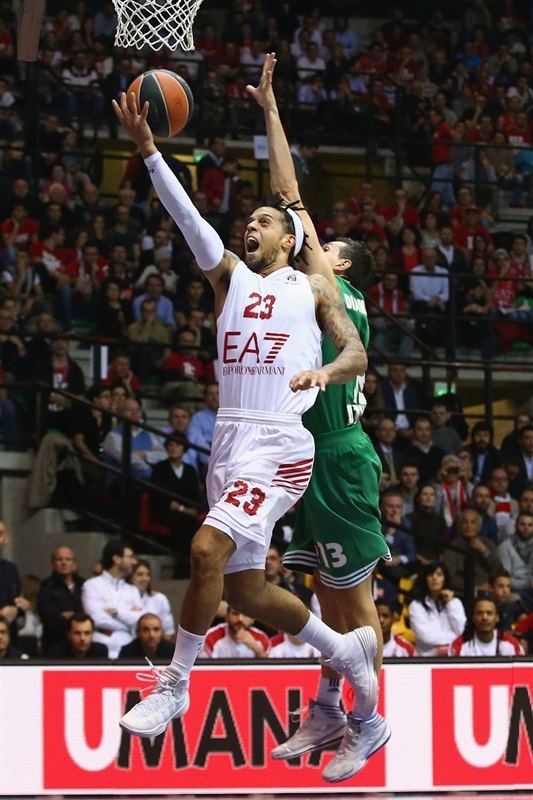 The veteran playmaker was then fouled with 0.7 seconds remaining, but missed both free throws to give Milan the win. 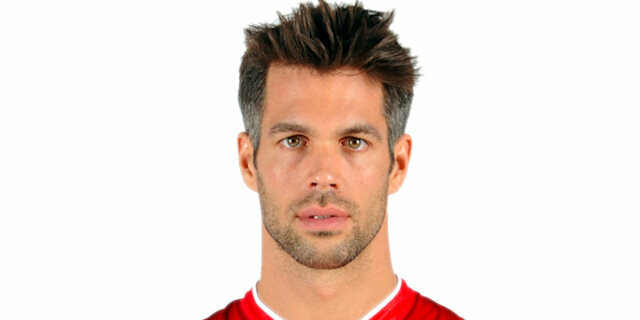 "It was a difficult game. We fought for 40 minutes with the right intensity. 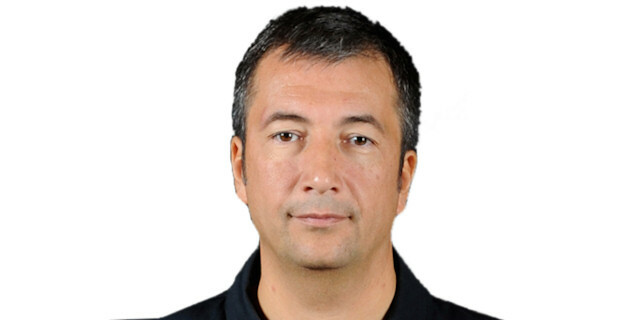 I hope that this game can be the best way to start the next part of our Euroleague season." "We are into the Top 16. We are really happy. It was a great win. They are a great team. But we played really tough defense. They missed the last free throws, but we did a great job."